I had been puzzling for a while about how I could make a pendant to compliment my ‘Perfect Symmetry’ collection of rings. 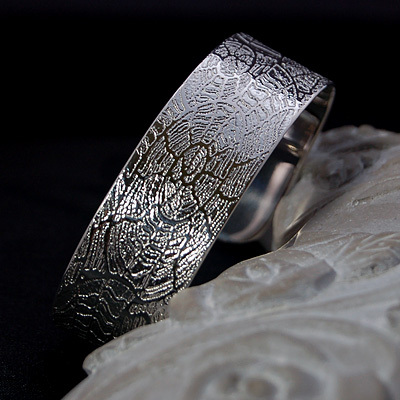 Initially, I wanted to create something based around a circular design in recognition of the rings’ shape, but I could find no pleasing way of incorporating the symmetrical scroll elements whilst also maintaining a true circle form. Eventually I decided to just take a straight piece of round silver wire of significant diameter, taper the ends sufficiently to enable me to create the scrolls, and then play around with this and a pair of half round pliers until the metal took on an interesting shape. After a good deal of bending, hammering and annealing, a good shape seemed to present itself. Continuing with the twining tendrils theme, I added a further piece of scrolled wire to the top of the pendant to create a bail. I am really pleased with this small detail which enhances the overall effect of the piece. 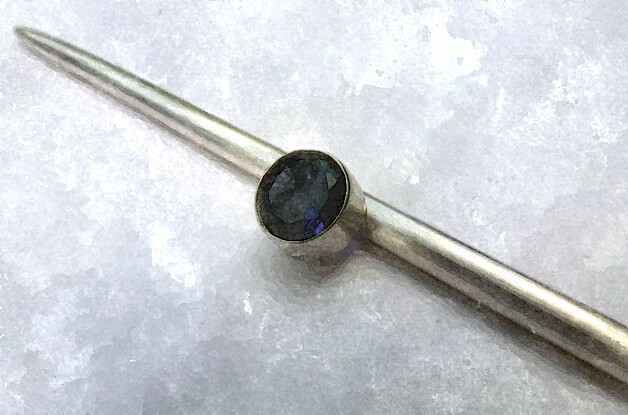 The bezel will be filled with a 6mm round deep violet Iolite stone, the companion to that used in the ‘Symmetry with Iolite’ ring. 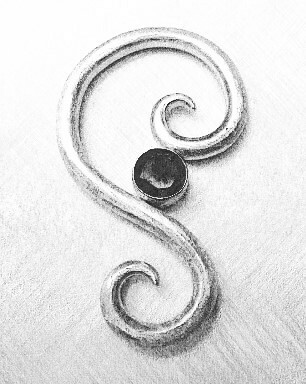 On seeing the design sketches for this pendant, a colleague commented that it looked a little like a musical treble clef symbol; it’s not quite, but I’m now thinking how I could use that idea for a future design! 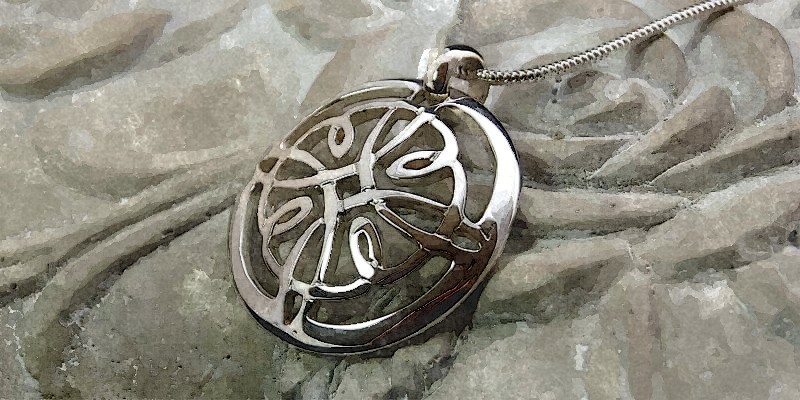 I’ve a real passion for Celtic knotwork and after the success of the Celtic Cross pendant I was longing to explore more ideas. Charm bracelets are still proving very popular, so I thought I’d have a go at creating my own version of this style. 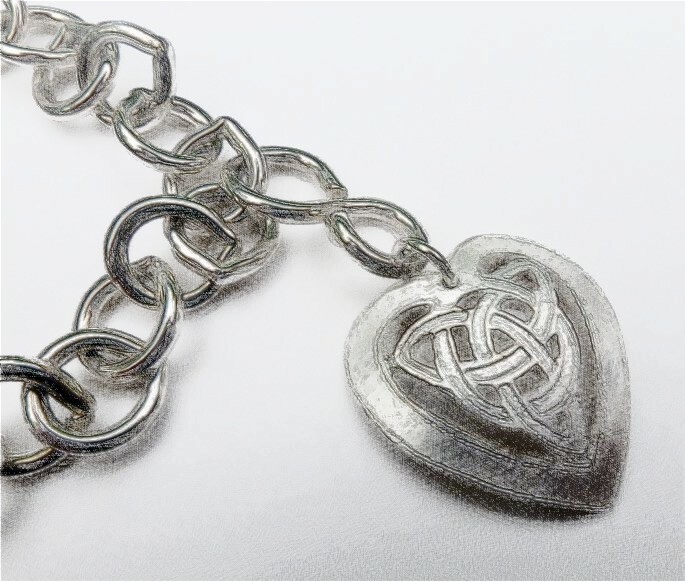 Working with a large link trace chain in solid sterling silver for the bracelet element, I chose a knotwork heart design from which to handcraft a single silver charm. 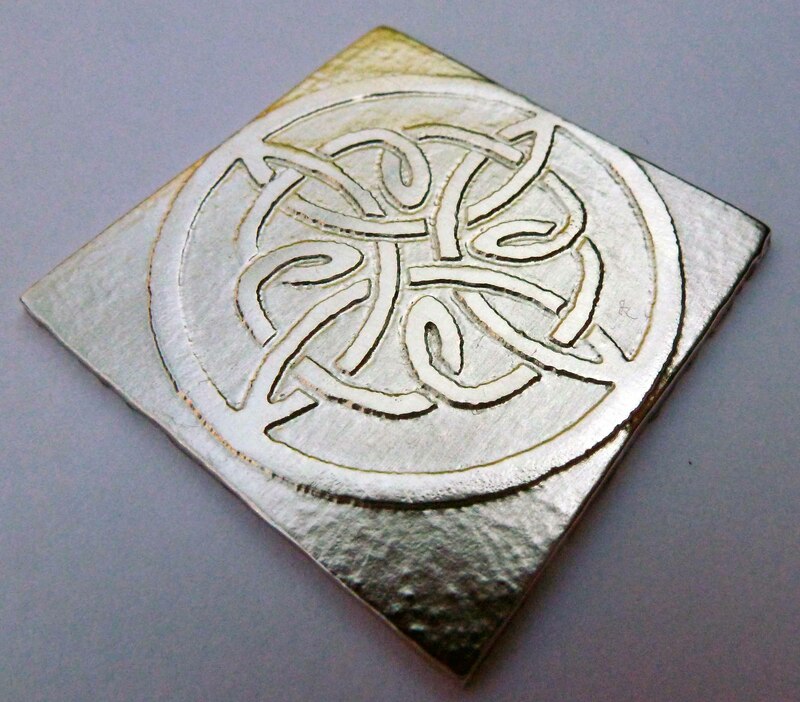 The detail of the design was hand-pierced from solid silver sheet, then filed into shape and formed. 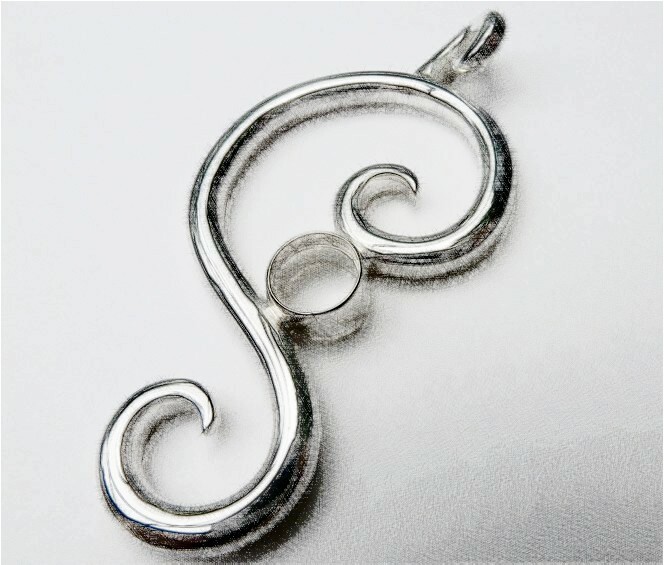 The charm is then attached to a custom made figure of eight link on the chain via a jump ring. 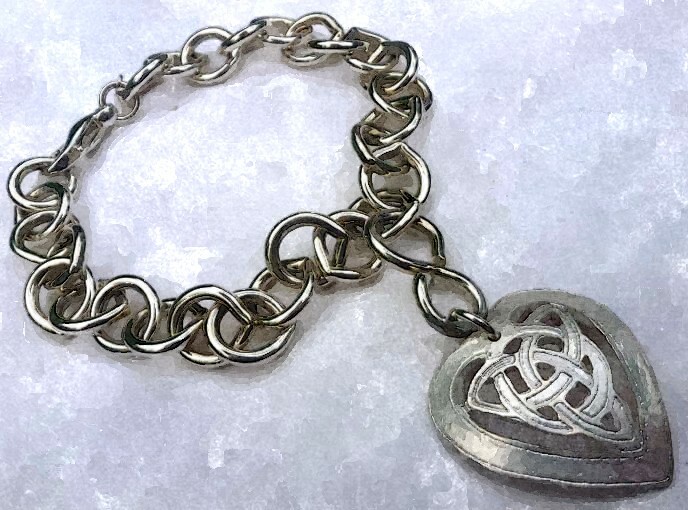 Additional charms could be added to the bracelet chain, but I am all for classic simplicity and think that the beautifully detailed Celtic knot charm needs no accompaniment. What a relief when a challenging piece of work you took on with gritted teeth turns out well; even more so when the result is so much better than you could have hoped and leads to another commission! 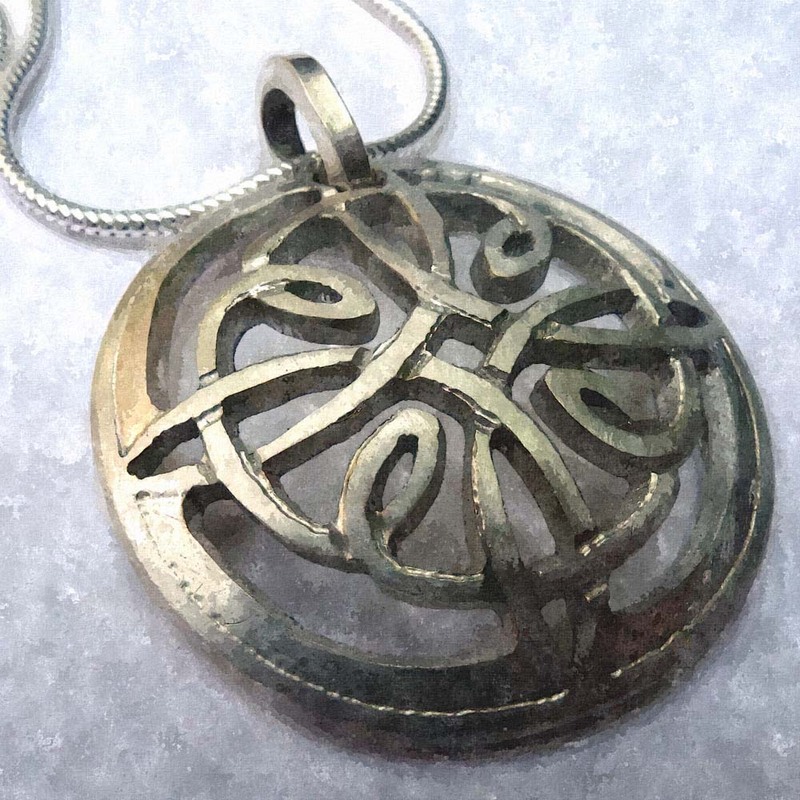 This beautiful Celtic Cross pendant did give me one or two sleepless nights, but my client was so thrilled and enthusiastic about the result that I have to admit that every moment was worth it. The whole piece was hand pierced using a saw frame with blade and then each and every element of the detailed design had to be hand finished with file and emery paper; it took time and patience, but I hope you’ll agree that all that work has paid off with interest. 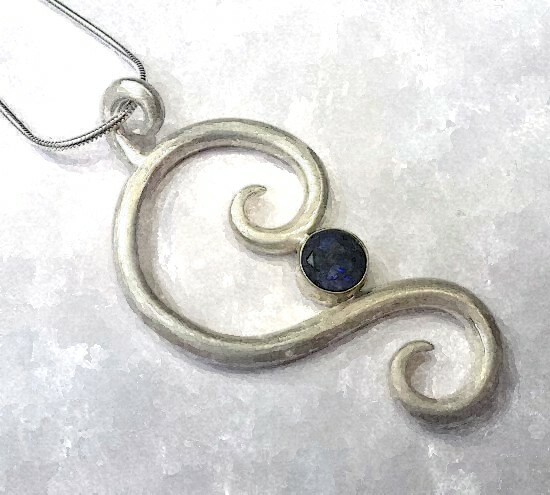 I now feel confident enough to tackle another similar project, and am currently playing with a few designs that I think will make a good home for a stunning facet cut blue moonstone that I have in stock. I’ve been wondering for a while how best to use it and I think I might well have found the perfect answer. 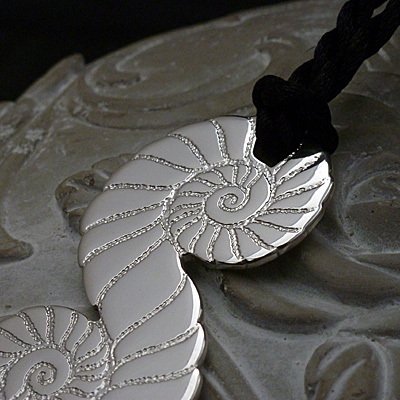 Another variation on the ‘Fossils in Silver’ theme, this time making use of the perfect symmetry created by the seamless joining of two ammonite fossils to create a representation of a figure of eight on its side, which is customarily associated with ‘Infinity’. This symbol might also be used to depict the ‘ouroboros’, the alchemical sigil designating the cyclical nature and endlessness of all things. 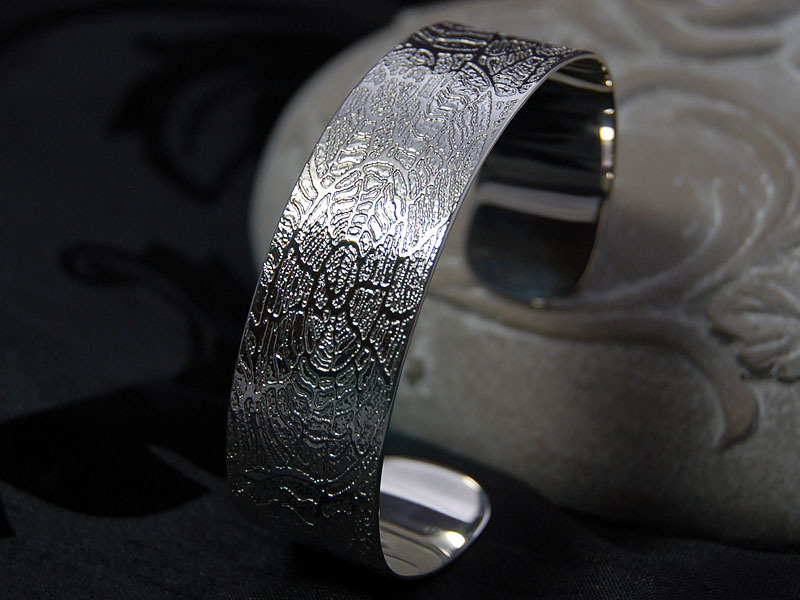 This is a solid sterling silver piece which is both bold and beautiful. 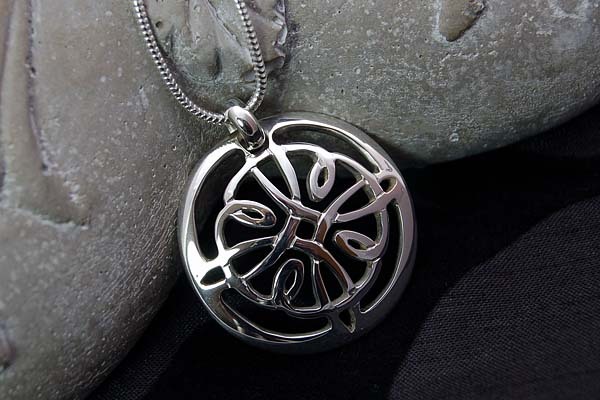 It is enhanced by a black silk necklet which has been threaded and knotted through the pendant’s integral bail loop. A stunning complement to that little black cocktail dress now that we’re racing headlong towards the Christmas party season … grab it while you can! I’m certainly not the greatest wielder of a saw frame in the world, but I’m also not easily discouraged by a piece of work that involves a good deal of piercing; I break my fair share of saw blades in the process, but doesn’t everyone? On the other hand, I did quake slightly at the thought of making this commissioned pendant – not so fearful of the actual piercing, but rather in the amount of careful finishing necessary to bring all those cut edges from their initial rough state (despite my prudent choice of a fine-toothed blade for the job) to a smooth and highly polished finish – they say the devil’s in the detail and this piece is certainly proving to be solid proof of the truth in that old adage. Once I had the design in place, the next step was to identify and mark which areas were to be removed with the saw and then, using a centre punch, mark out a seat for the drill bit in each area. After drilling all the holes needed to give access to the saw blade, I set about the task of carefully threading the saw blade through the metal, getting it up to tension in the frame and then piercing out as accurately as possible the design from the metal. Now begins the task I am least looking forward to; the painstaking work of filing, emerying and polishing each and every nook and cranny to get as perfect a finish on the piece as I am able. 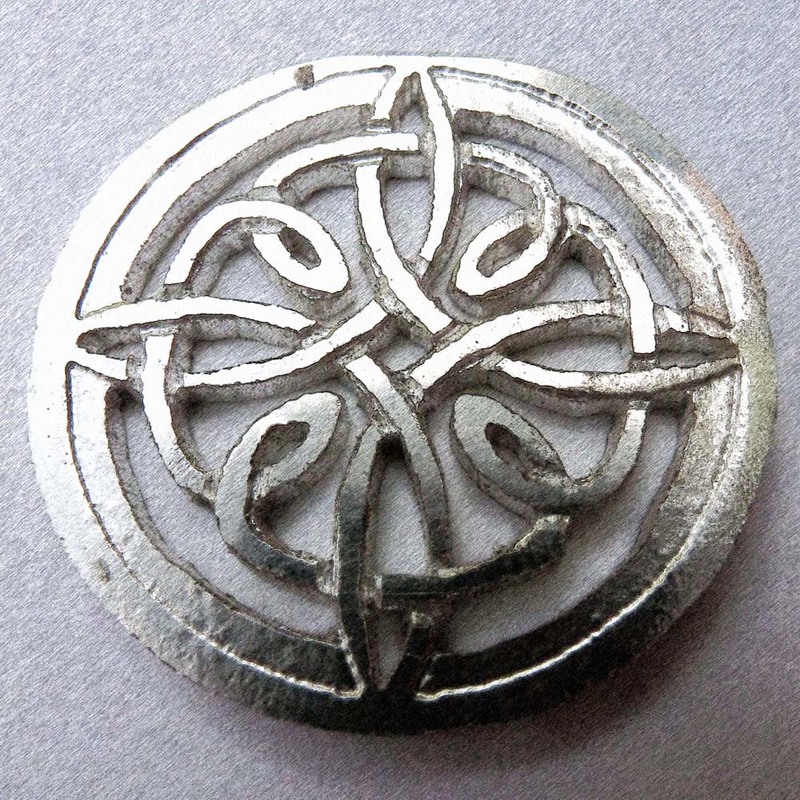 As you will see from the first image above, the pendant has been domed slightly and this will help access some of the smaller, more awkward areas as the doming process stretches the metal and opens up the gaps in the design a little. Lastly I’ll make a chunky bail out of silver wire and solder that into place. My collection of ‘Fossils in Silver’ continues to grow. This group of pendants all developed out of the original idea for the fossil cufflinks which started me down this particular design path. 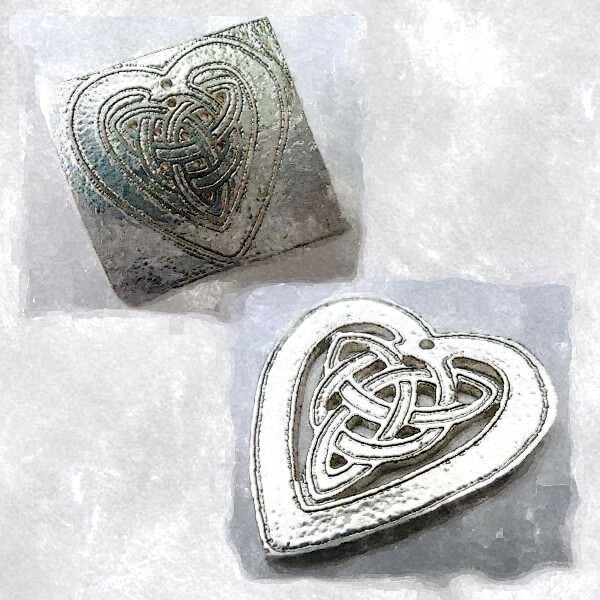 Having seen how well the shape worked when dapped using a doming block, I started playing with ideas for creating a pendant. My first attempt simply took the same outline as the cufflinks, enlarged it slightly, formed it with block and punch to give it greater structure and depth, and finally adding a bead bail to make a simple but effective everyday wear pendant. From there it was a simple jump to consider adding a gemstone. 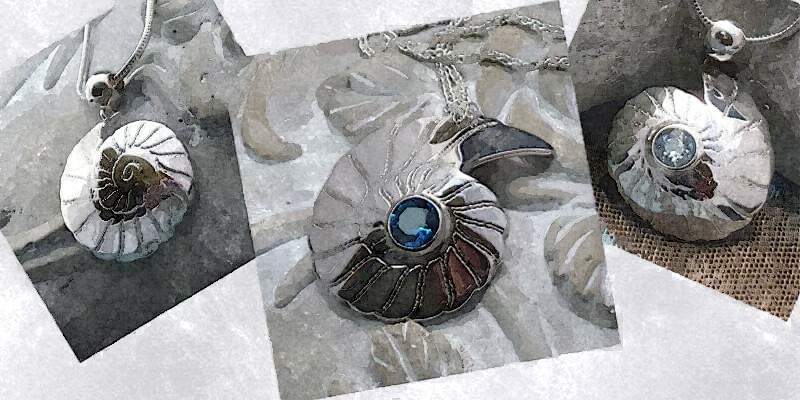 I repeated the small pendant design, but this time enhanced it by setting a 4mm Sky Blue Topaz gemstone into a bezel placed at the heart of the silver fossil. Finally, I decided to ‘go large’! 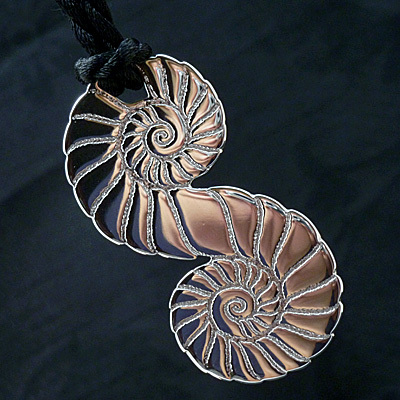 The last pendant in the set is, I think, the most stunning. It follows the basic pattern of the others but is much bolder. It is embellished with a large, beautifully deep coloured London Blue Topaz gemstone. I have also pierced out a shaped integral bail and the whole piece is set off to perfection with a knotted 1.5 mm thick Spiga (plaited) sterling silver chain. I really love the overall effect of this piece – I have no doubt that it will get noticed! Any ideas or suggestions gratefully received! The Gift ~ A Silver Stocking Filler! 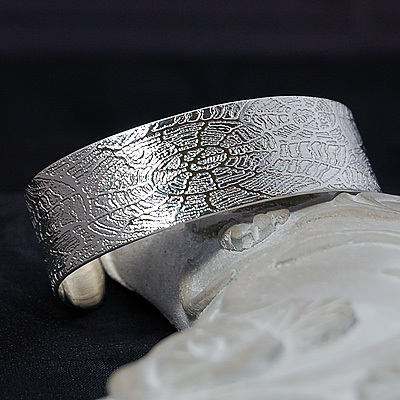 Please take a moment to visit the Ana Benedicta Handmade Jewellery website to discover more about Ana's work ~ just click on the image above or the link below.